Only ninety-seven of these babies to go. After dinner this evening, I got out the scissors and overlocker and cut and sewed another Kwik Sew pull-on knit skirt. This one is a gift for my sister. 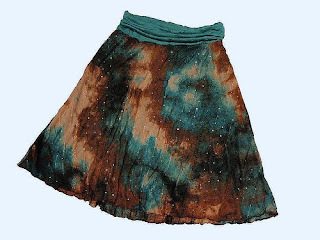 I made her skirt using a length of crinkle jersey and a sequin and lace embellished, tie-dyed mesh. The mesh was pretty tricky to work with, but I did manage to sew the whole skirt from start to finish using just my overlocker. I used the rolled hem feature for the first time and I quite liked the way it finished the mesh fabric. It feels reassuring to have a pattern in my repertoire that is so quick and easy to make. Learning dressmaking is challenging - and sometimes frustrating or demoralising - so quick wins are a great counterbalance. (Did you think I was only joking about the other 97 skirts?). Frustrating and demoralising, yes that does sound familiar. But when it works... oh when it works!! Are we counting up or counting down? frustrating and demoralising! I love it!!! perfect description!!! OK - I've gotta find that pattern! Hurray for finding patterns that just work! I LOVE an good instant-gratification don't-have-to-think-about-it skirt pattern. I slashed my way through most of my dress-length stash over xmas because I made the perfect skirt pattern for me. Skirts and I just struggle to be friends, as I was reminded this week after attemping friendship for a few days. They show my scarred legs, they allow my thighs to rub together but they do make me feel good when I need it. Great to see you again yesterday and meet Argy! That fabric is stunning, and why not enjoy the feeling of being accomplished? Why the hell not? That fabric is quite amazing, lucky sister! You've convinced me, I'm off to get that pattern (& check out your other pattern reviews), I love PR. What a great skirt pattern, do you think it will last another 97 rounds?